Even with higher degrees of academic challenge, NIST continues to keep its momentum in maintaining the high pass percentage in NEBOSH IGC qualification. To meet the myriad of issues and challenges in the academic setting, our institute adopts unique strategies in all facets of the training delivery. Along with meeting these challenges, the strategies would also help the delegates to balance academic demands with work, personal responsibilities and social experiences which in turn leads to a landmark achievement. Being an international safety course provider for more than a decade, NIST is pleased to inform that delegates of IGC corporate batch achieved exemplary grades in NEBOSH IGC examination. Out of the 19 delegates, most of them were passed with good grades and in particular eight of them earned credit scores. Another phenomenal achievement is 100% pass percentage in GC3 project. At this moment, we extend our heartiest congratulations to our dedicated trainer, Mr. Robert Chettiar, who paves the way for this marvelous achievement. Delegates participated in this training program are professionals of various disciplines and the employees of world's largest aluminium rolling company and Asia's biggest producers of primary aluminium. Their work premises are fully equipped with state-of art world-class copper smelter (i.e. extracting of metal from ore) and fertiliser plant machineries. Due to high-tech work environment, there is always the chance of occurrence of unanticipated hazards and risks in their workplace. 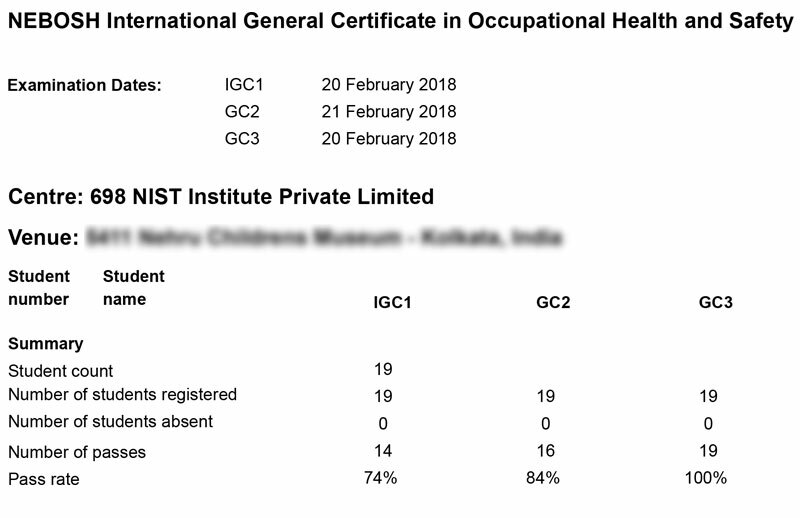 To cut the cost of accidents, illness at work, and place effective control measures, the employer of their organization approached us to deliver training on NEBOSH IGC course qualification, as it is considered to be the internationally recognized for applying health and safety practices at the workplace. In the month of February 2018, we delivered training for 19 delegates in NEBOSH IGC on their premises. This training program was led by our dedicated trainer Mr. Robert Chettiar who instills confidence and motivation to create positive learning environment. Further, with his extensive experience and knowledge, he provides insight into current industry practices and trends for helping the participants to discharge their responsibilities without any hassles even in the challenging and complex work environments. On account of all his contributions and efforts, we have achieved extraordinary results in NEBOSH IGC. Apart from the excellent overall results, most of the delegates applauded our quality of training and liked the methodology of our trainer - 'Teach Smarter Not Harder'. They also impressed by our support in all the academic related queries especially in the GC3 project submission. We would also like to thank our delegates for striving hard to reach their goal as destined. They have touched the peak of success through their incessant hard work and dedication. During the intensive 10-days of training program, there were no deviations and non-conformances from our delegates. They completely focused on the subject and taken all our challenging assessments and mock exams seriously. On the whole, it is extremely happy for us to celebrate phenomenal results of our student and transforming the delegates from generalist to competent safety professional. At last, this landmark achievement would not have been possible without generous support and co-operation of NIST employees who contributed directly or indirectly in successful accomplishment of this training project. This type of results would give us confidence and courage to make our organization grow beyond its current status. As the employees of NIST, we should always strive to put our constant and determined efforts to make our organization flourish continuously. On behalf of NIST, we congratulate delegates for their astonishing achievement in the IGC exam and wish them 'All the Best' in their future endeavors.